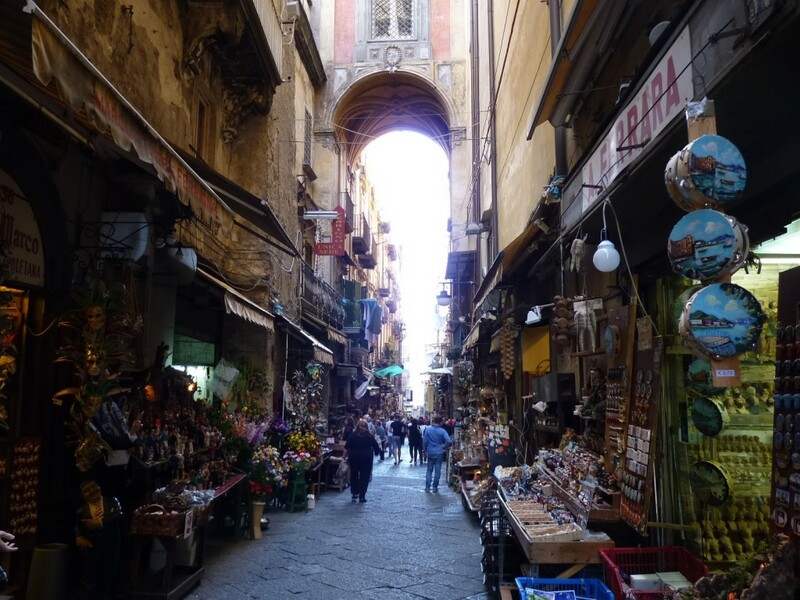 You can feel the heart, the soul and the history of Naples walking along the streets of the historical centre and in particular along via San Gregorio Armeno, a most famous street worldwide known for its tiny shops of artisans who work all the year round to realize holy cribs and decorations for Christmas. So the magic of Christmas is always alive in this street, a narrow cobble stoned alley running between via dei Tribunali and via San Biagio dei Librai. Even though it’s at Christmas time that this tiny street becomes a giant Presepe and attracts thousands of tourists charmed by the mastery of the artisans. Also the Neapolitans use to go to San Gregorio each year to buy traditional Nativity figures and symbolic characters like butchers, bakers and pizza makers who recall everyday life in the 18th century as well as large and small cribs some adorned with lights and water elements. The artisans not only create the finely crafted figures following ancient techniques, dating back to 18th century, but they also create tiny statues representing famous Italian and foreign politicians, actors or football players. But you can leave for a while the cheerful and characteristic atmosphere of the street entering the beautiful baroque church of San Gregorio Armeno with its peaceful cloister and beautiful bell-tower that will make you forget for a while the noisy bustle.